and 2nd overall. He did it the hard way. record time despite the horrific weather. Way ahead with nobody else in sight. If you ever wanted proof that most of what we regard as being the inevitable consequences of getting old is simply not true, it is the performance of the Moller Brothers (Gordon, Bruce and Gary) in this year's Upper Murray Challenge (Snowy Mountains Australia). We won the race outright, beating the two best individual Australian multisporters of recent years (Jarad Kohlar and Luke Haines) into 2nd and 3rd placings respectively. 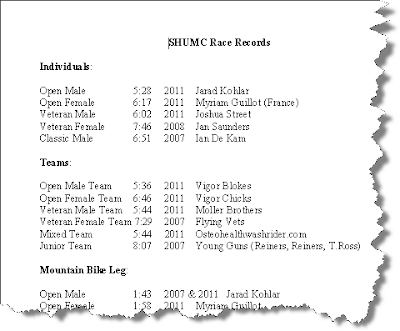 In doing so, we set new course records in the Open Team and Veteran Team divisions and Gordon broke the run section record which was astonishing given the slippery and muddy conditions. 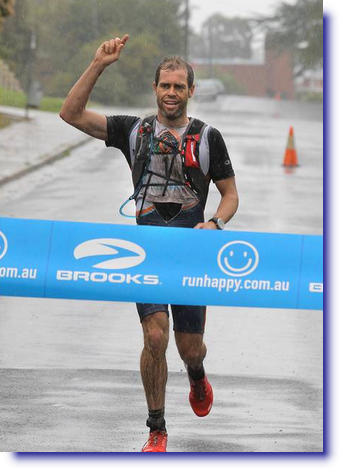 Gordon, was the only runner to break two hours for the grueling mountain run. 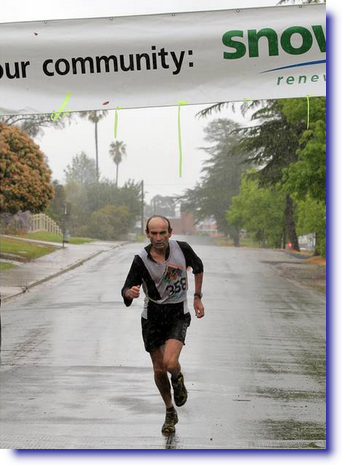 He hammered that leg of the race finishing in record time way ahead of the next runner! We were about an hour ahead of the next Veteran Team and about 40 minutes ahead of the first Open Team. I finished the mountain bike section in 4th place overall, Bruce brought us up to 2nd place with an impressive paddling performance and then Gordon astonished every one by mowing down Jarad during the mountain run. I think this is the first time that a team has won the event outright. 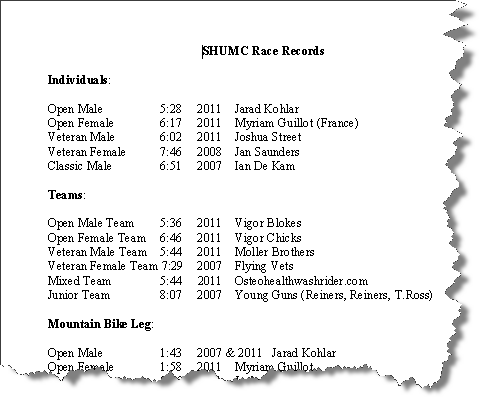 The pros, like Jarad and Luke have always dominated the race. Until now, that is. Lining up for a wet, cold start. A very wet, cold and muddy Moller! We set these course records in the worst conditions of the ten year history of the event. It rained all day, making the mountain bike and run a treacherously slippery slog and there was the possibility of the kayak section being cancelled for safety reasons. Thankfully it was not. When you look at the results below, you will note that Luke had a bad day. It was tough out there and Luke looked hypothermic by the end of the paddle leg. It is to his credit that he hung in there to the end to take 3rd place overall. Jarad ran a phenomenal race when you consider the conditions. going to hang around in the rain just for you! All three of us are over 50. I am 59 next week. My own aerobic performance has improved by about 20% over the last five years. Despite the atrocious weather, Gordon and Bruce smashed their times as compared to last year, or the year before. These should be declining. From about age 28 there begins a gradual decline in aerobic power by the factor of 0.001 per year. So, by age 50 the average person has about half the aerobic potential that they had in their 20's. The faster this decline, the sooner we start falling to pieces and the sooner we die. Sounds depressing eh? and how much is due to controllable factors? For more about this fascinating topic, please take a few minutes to read this article and the others that are linked to it. when you consider the weather!